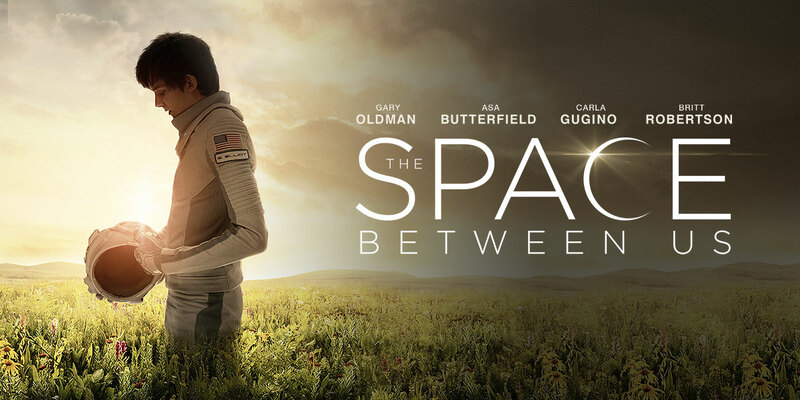 The Space Between Us is a science fiction romantic adventure biopunk dramedy staring the guy from Ender's Game as a boy born and raised on Mars, dreaming of Earth, and taking a desperate and risky journey to find his true origins. Asa Butterfield (Ender's Game) stars as Gardner Elliot, who was secretly conceived of the leader of the first colonial mission to Mars. His existence is covered up by NASA and he is raised by a scientist, Carla Gugino (Spy Kids, Sin City), into a socially awkward computer genius with a biology that prevents him from being able to return to Earth. The cast is rounded out with Gary Oldman (The Fifth Element) as the founder of the organization that founded the colony on Mars, and Britt Robertson (Power Rangers Time Force) as a friend of Gardner he only knows through the internet. As of this writing, Chris Pratt is listed first in the cast on Wikipedia. Not really sure what that's about. The Space Between Us feels like it's in the same camp as Stranger Things or Super 8. They harken back to classic films in their genre while tugging at some nostalgia strings. In this case, the film feels like a classic astronaut/space movie, which hasn't really been a thing in a while. I got vibes of Space Cowboys, while also feeling some childlike wonder for old cult classics such as Flight of the Navigator. There's even an 80s, Johnny 5 style robot for pretty much no reason. Asa Butterfield does a fantastic job as Gardner, a teenager raised by scientists in a bubble with little connection to Earth and society as we know it. He's awkward and weird and everything that comes out of his mouth makes you realize how important socialization skills are. An unexpected surprise comes from the film's level of comedy, usually from Garner's fish out of water personality. While this is ultimately a romantic space drama, it's still really funny. What few social skills Gardner has were picked up from old movies. His interactions with others carry the movie. It's telling that the only person who has perfect chemistry with is a robot. Another place this film excels is in it's depiction of the future. Taking place in the mid 2030s, we see only minimal advances in technology. It's not like some movies where humans apparently through everything out and replaced them with fancy gadgets in 2020. Just as some technology from the 1960 is unchanged today, the film shows basic things like cars and planes while only depicting cool sci fi versions of computers and phones. It feels very natural and I was glad it wasn't all "Welcome to the future!" The Space Between Us may not be an epic superhero action movie where the fate of the universe is at stake, but it is still a solid piece of science fiction. The characters are adorable and, despite there being absolutely no room for a sequel, I want to see more of them.